A Japanese electronics store has begun selling a digital camera that will definitely be recycled - because otherwise you won’t get a copy of your photos. The Eco Digi Mode camera doesn’t accept Micro SD cards or USB cables. This prevents users from accessing the images and forces them to return the camera to the store, where they're provided with a copy of all their pictures on a CD. The transfer is included in the camera’s price. The store then handles the entire breakdown and recycling process of the camera, with some parts – such as the 2.4in LCD display – used to make mobile phone screens. Though we suspect many will be wiped and re-sold first. Unfortunately, the camera’s only available in two forms, one that can store 27 pics and another that can take 50 shots. However, the three-megapixel snapper only measures 120 x 71 x 53mm, and users can also buy a waterproof case for it. 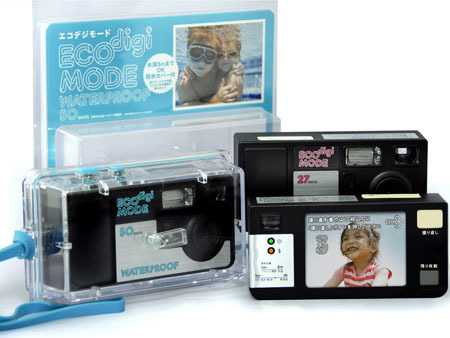 The Eco Digi Mode camera is available now from Palette Plaza stores in Japan, priced at roughly ¥1983 ($18/€12/£9). A UK price hasn’t been snapped yet.